The Jervis Bay Territory (/ˈdʒɑːrvɪs/ or /ˈdʒɜːrvəs/) is a territory of the Commonwealth of Australia. It was surrendered by the state of New South Wales to the Commonwealth Government in 1915 so the Australian Capital Territory would have access to the sea. 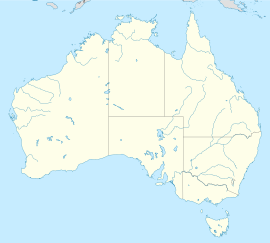 It was administered by the Department of the Interior (and later by the Department of the Capital Territory) as if it were part of the Australian Capital Territory, although it has always been a separate Commonwealth territory. The perception that it is part of the ACT stems from the fact that under the terms of the Jervis Bay Territory Acceptance Act, the laws of the ACT apply to the Jervis Bay Territory. In 1989, when the ACT achieved self-government, the Department of The Arts, Sport, The Environment, Tourism and Territories took over responsibility for the JBT's administration, and it has since been administered by various Commonwealth Departments responsible to the Minister for Territories. Jervis Bay has a long history of Indigenous Australian settlement. Booderee, the name of the national park that covers the majority of the Jervis Bay Territory, means ‘bay of plenty’ or ‘plenty of fish’ in the local Aboriginal language. The Yuin people have a strong and continuing connection to the Jervis Bay area. It was decided in December 2016 to apply for Native Title, to recognise the long and ongoing connection. The bay was sighted by Lieutenant James Cook aboard HMS Endeavour on 25 April 1770 (two days after Saint George's Day) and he named the southern headland Cape St George. In August 1791 the bay was entered and named by Lieutenant Richard Bowen aboard the convict transport ship Atlantic of the Third Fleet in honour of Admiral John Jervis, under whom he had served. In November 1791 Master Matthew Weatherhead aboard the Matilda entered the bay to undertake repairs. Survivors of the Sydney Cove shipwreck in 1797 reached the area by foot, heading to Port Jackson. Explorer George Bass entered the bay on 10 December 1797. He named Bowen Island. John Oxley, an English explorer and surveyor, travelled from Sydney by sea to explore the bay in 1819. At the time of federation, to allay fears that it would have too much influence in the federal government, New South Wales had agreed to surrender territory for the Australian Capital Territory and to allow it access to the sea. Jervis Bay was selected to be that federal port. The crown land in the area was granted by New South Wales to the Commonwealth in 1909 at the same time that the ACT was surrendered to the Commonwealth. In 1915 the jurisdiction over the Jervis Bay Territory was also surrendered to the Commonwealth. NSW also granted to Commonwealth permission to build a rail corridor linking the two territories but this was never implemented. At the 2016 census, 391 people lived in the territory, the majority working and living at the Royal Australian Navy (RAN) base, HMAS Creswell. The area of land and water owned by the Wreck Bay Aboriginal Community Council in the JBT is approximately 68 km2 (26 sq mi), which is about 90% of the land. The remaining land in the JBT is managed by the Department of Infrastructure, Regional Development and Cities. There is an Aboriginal community at Wreck Bay in the Booderee National Park. Vincentia is the nearest town, roughly 3 km (2 mi) north of the border. Jervis Bay Territory is administered by the Department of Infrastructure, Regional Development and Cities. However, it is counted as part of the ACT for the purpose of the ACT's representation in the Senate; and it forms part of the Division of Fenner for House of Representatives purposes. For most purposes, the territory is governed under the laws of the Australian Capital Territory, by the Jervis Bay Administration, which handles matters normally concerned with local or state government, and provides primary school teachers and Australian Federal Police staffing. Residents have access to the courts of the ACT, but are not separately represented in the ACT Legislative Assembly. The Jervis Bay Territory is in the Commonwealth Electoral Division of Fenner. Jervis Bay Territory residents are not represented at the local or State government level but have access to the decision-making process through community organisations. The Defence Force Discipline Act (DFDA) Section 61 makes all Australian Defence Force members and "Defence Civilians" subject to the criminal laws of the Jervis Bay Territory regardless of where the offence occurred. This is a legal device which makes Defence personnel subject to the Crimes Act 1914 (Cth), the Criminal Code Act 1995 (Cth) and offences against the criminal law of the ACT, as military law, even if the offence is committed outside Australia. The Commonwealth contracts the ACT government to provide courts, education and welfare, the Government of New South Wales for rural fire services and community health, Shoalhaven City Council for waste collection and library services, and commercial providers for electricity and water supplies. Having 65.7 km2 (25 sq mi) of land and 8.9 km2 (3 sq mi) marine reserve, Jervis Bay Territory is the smallest of all the mainland states and territories of Australia. Jervis Bay is a natural harbour 16 km (10 mi) north-south and 10 km (6 mi) east-west, opening to the east onto the Pacific Ocean. The bay is situated about 198 km (123 mi) south of the city of Sydney, on the southern coast of New South Wales. The nearest city is Nowra, about 40 km (25 mi) on the Shoalhaven River to the north. The majority of Jervis Bay embayment is part of Jervis Bay Marine Park (NSW State) but the waters within JB Territory are part of Booderee National Park (Commonwealth). Booderee National Park was formerly known as Jervis Bay National Park (Commonwealth). Ancient sand dunes overlay the sedimentary bedrock formations formed from upheaval of the surrounding marine environment 280–225 million years ago. The park was designated sacred Aboriginal land in 1995. A significant portion of the bay's northern coast and headland forming Beecroft Peninsula and ending at Point Perpendicular and surrounding area is a gun bombardment range for the Royal Australian Navy. There are three small lakes within the territory: Lake Windermere, the largest, with an area of 31 ha (77 acres), Lake Mckenzie, 7 ha (17 acres), and Blacks Waterhole 1.4 ha (3.5 acres). Bowen Island, at the entrance to the bay 230 m (750 ft) north of Governors Head, is 51 ha (130 acres) in area. It has rookeries for the little penguin Eudyptula minor. There are four private leasehold properties in Jervis Bay Territory, within but not part of Booderee National Park. Among these leasehold properties is the historic, heritage-listed Christians Minde settlement, which was founded in 1880 by the Ellmoos family from Denmark. Christians Minde was the first guesthouse on the NSW south coast between Port Hacking and Twofold Bay. The properties Christian's Minde, Kullindi and Ellmoos have been consistently inhabited and looked after by descendants and relatives of the first settlers. Many members of the family are buried in a cemetery on a hill, surrounded by dense bush near the settlement. Within the Booderee National Park is HMAS Creswell, the Royal Australian Navy College named after Sir William Rooke Creswell, the Director of the Commonwealth Naval Forces which later became the RAN. The Jervis Bay Airfield is adjacent, operated by the RAN to support its BAE Systems Kalkara (Storm Petrel) pilotless target aircraft. Kalkaras are launched from the airfield and later recovered by parachute into the water and thence by boats maintained at HMAS Creswell, after target-towing exercises off the coast with ships or aircraft. Control equipment is sited at Bherwerre Ridge overlooking the sea to the east. The territory was once the proposed location for a nuclear power plant. The project, which was to be on the south east corner of the Bay near Murray's Beach, was cancelled in 1971. This was after preparatory excavation and levelling had been done and an access road constructed between the site and the territory border. The levelled area is now the car park for Murray's Beach and its adjacent boat ramp. ^ a b Australian Bureau of Statistics (27 June 2017). "Jervis Bay Territory (OT)". 2016 Census QuickStats. Retrieved 28 February 2018. ^ Australian Bureau of Statistics (31 October 2012). "2011 Community Profiles: Jervis Bay (OT)". 2011 Census of Population and Housing. Retrieved 8 May 2013. ^ "Profile of the electoral division of Fenner". Australian Electoral Commission. 8 February 2016. Retrieved 25 June 2016. ^ a b c "Jervis Bay (Point Perpendicular AWS)". Climate statistics for Australian locations. Bureau of Meteorology. Retrieved 8 May 2013. ^ The ABC Standing Committee on Spoken English: A guide to the pronunciation of Australian place names. Angus & Robertson 1957. p. Pg 61. ^ "Seat of Government Surrender Act (NSW) Act 9 of 1915". This document, assented to by the Governor-General in 1915, provided for the transfer of 28 square miles of land at Jervis Bay to the Commonwealth, in addition to the areas surrendered under the Seat of Government Acceptance Act 1909 and the Seat of Government Surrender Act 1909. Museum of Australian Democracy. Retrieved 17 January 2013. ^ "Jervis Bay area Most Suitable for Commonwealth Purposes". A portion of land at Jervis Bay was included in the Federal Capital Territory to provide a seaport for Australia’s only inland capital. Museum of Australian Democracy. Archived from the original on 28 April 2013. Retrieved 17 January 2013. ^ "Our Culture". Parks Australia. Retrieved 13 October 2017. ^ "South Coast Native Title meeting at Narooma a big boost for Yuin people". South Coast Register. Retrieved 13 October 2017. ^ a b Place Names of Australia (Reed, 1973). ^ a b c d e f Crabb, Peter (2007). Jervis Bay and St Georges Basin 1788–1939 : an emptied landscape. Lady Denman Heritage Complex. ISBN 095864473X. ^ "The Sydney Cove". Tasmania Parks and Wildlife Service. Retrieved 31 August 2014. ^ "Seat of Government Acceptance Act 1909". Retrieved 7 December 2015. ^ "Jervis Bay Territory Acceptance Act 1915". Retrieved 7 December 2015. ^ "Territories of Australia". The Department of Infrastructure and Regional Development. Australian Government. Retrieved 2 August 2015. ^ Lindenmayer, David; MacGregor, Christopher; Dexter, Nick; Fortescue, Martin (2014). Booderee National Park. CSIRO Publishing. ISBN 9781486300426. ^ "Christians Minde Settlement, Ellmoos Rd, Sussex Inlet, ACT, Australia". Australian Heritage Database. Department of Environment and Energy. Retrieved 28 January 2018. ^ "The Ellmoos Story". Sussex Inlet Community. Retrieved 28 January 2018. ^ "Walking trails brochure - Booderee National Park" (PDF). Environment.gov.au. Retrieved 17 July 2016. ^ "Christians Minde". Christiansmindejervisbay.com. Retrieved 17 July 2016. ^ "Kullindi Homestead". Kullindi Homestead. Retrieved 17 July 2016. ^ "Rail, Tram and Bus Union NSW Branch: Holiday Bookings". Rtbu-nsw.asn.au. 15 November 2007. Retrieved 17 July 2016. ^ "Jervis Bay, Sussex Inlet, & Hyams Beach holiday accommodation". Bay of Plenty Lodges. 11 November 2010. Archived from the original on 4 May 2012. Retrieved 17 July 2016.